Lars Petter Nordhaug (Sky Procycling) nabbed the biggest victory of his career in the Grand Prix Cycliste de Montréal on Sunday, coming back on Moreno Moser (Liquigas-Cannondale) and Alexander Kolobnev (Katusha) in the closing meters. The victory is Nordhaug’s second in a month, after the Norwegian took stage three of the Tour of Denmark, and the lesser-known Norwegian rider continues on some sparkling form at the end of the season. Nordhaug went away for the first time with still 5km to race, in a battle that looked as if it would end with a bunch sprint, with Peter Sagan (Liquigas-Cannondale) strategically placed in the lead bunch for his team. Nordhaug’s gap was never very large with several riders looking to keep him close, and an elite selection of about 25 was present just behind. With Moser, as well as riders from Vacansoleil-DCM and Katusha chasing, Nordhaug continued to dangle out front alone for more than three kilometres, before being joined by three men with two kilometres to go. Kolobnev made a serious attack with Nordhaug behind him and took the one-kilometre banner alone. Moser dug deep and dragged the Russian back before making a move for the line on his own, but Nordhaug had clung to the wheel of the young Italian. When Moser started to flag within sight of the line, the Norwegian came out of his wheel and blasted over the line, celebrating his biggest victory. “It’s incredible. I was riding for [Edvald] Boasson Hagen today, and we thought it was going to be a sprint,” Nordhaug said afterward. “I tried to sit at the front and cover the attack. I saw three guys were coming, I waited a bit, and I thought I wasn’t going to take the sprint, because the other guys were fast. But I had unbelievable legs. Moser was probably the favourite among the final three men, but was out of gas in the finale and could not hold on to the speed he had used to close down Kolobnev. “In the last 100 meters there was nothing in my legs,” Moser admitted. “It’s a good race. It’s a hard race, but a great race, as there were many people on the climb. At the beginning of the season I didn’t think I would do what I’ve done,” said the five-time winner in 2012. The first two-thirds of the 205-kilometre day was highlighted by a three-man breakaway, with a chase group of two trying to bridge but being unable. Cyril Gautier (Europcar), Egoi Martinez (Euskaltel-Euskadi) and Manuele Boaro (Saxo Bank-Tinkoff Bank) got the early television time, as did Kristjan Koren (Liquigas-Cannondale) and Simone Ponzi (Astana), who fought together throughout the first half of the day to get to the front. The first group of three maxed out its lead at four minutes, with the chasing duo hovering halfway between for the duration of its time out. The race got underway in earnest with 45km to race, when Boaro was dropped on a climb and Koren and Ponzi were pulled back by the peloton. The Montréal circuit featured two decisive climbs – the Côte de Camilien-Houde and the Côte de la Polytechnique - plus a short uphill leading to the finish line. Mirko Selvaggi (Vacansoleil-DCM) got the attacking underway from the peloton, and after being away for a few kilometres and inspiring a few chasers, all was soon back together. The peloton had cut the gap to the leaders down to 1’50” and shut off the gas momentarily, before Liquigas-Cannondale came to the front with Koren back in. Samuel Dumoulin (Cofidis) was paced back after a mechanical as the first of several moves was made by Markus Burghardt (BMC Racing), the first of which was covered by Alex Howes (Garmin-Sharp). With 40km to go, Burghardt accelerated again, this time taking a Europcar rider with him. With 35km to go, the peloton shut off once more and Omega Pharma-Quick Step moved forward. With the leading duo just a minute up the road, Johnny Hoogerland (Vacansoleil-DCM) made a move, along with Tim Wellens (Lotto-Belisol), who would be very active, plus Thomas Voeckler (Europcar). With so many pseudo-attacks being made, the gap to Gautier and Martinez tumbled, down to 30 seconds with 30km to the finish. Andriy Grivko (Astana) and Sylvain Chavanel (Omega Pharma-Quick Step) each played cards next, though too early to make anything stick, and everything was soon together again. Dennis Vanendert (Lotto-Belisol) went off the front for the better part of five kilometres with much of the peloton feeding, as defending race champion Rui Costa (Movistar) was near the fore. With 25km to go and Vanendert still away, Hoogerland flatted and faced a solo chase back as the peloton hit the Côte de Camilien-Houde on the penultimate lap. Simon Spilak (Katusha) and Anthony Charteau (Europcar) attacked into the bottom of the climb, while Vanendert was spit out the back, and Hoogerland successfully connected, showcasing some good conditioning to do so as quickly. Another acceleration by Lotto’s Wellens added to the pressure, and riders from Orica-GreenEdge and Movistar showed themselves at the front for the first time. Wellens was the first to claw back Gautier and Martinez with 20km to go, just as the bunch entered the Côte de la Polytechnique for the penultimate time. Everything would calm down again, before Grivko and Wellens pressured once more, followed by Burghardt. With Katusha and FDJ-BigMat’s Arthur Vichot pushing, a seven-man split formed. This did not include Burghardt, who hit the front of the peloton for BMC, sensing the danger of the seven, which did contain Grivko, Giovanni Visconti (Movistar), Luca Paolini (Katusha), and Michal Golas (Omega Pharma-Quick Step). With the group coming back, Voeckler jumped across, but all were together beginning the bell lap. David Tanner (Saxo Bank-Tinkoff Bank) attacked on the Camilien-Houde and the in-form David Veilleux (Europcar) tried to get across, inspiring the big names in the bunch to show themselves. 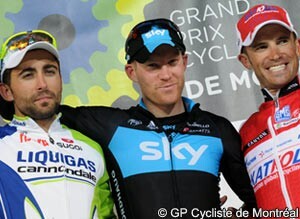 Ryder Hesjedal (Garmin-Sharp) and Jelle Vanendert (Lotto-Belisol) emerged along with Oliver Zaugg (Radioshack-Nissan). Behind, a crash ruined the chances of Janez Brajkovic (Astana), and also took out Gerald Ciolek (Omega Pharma-Quick Step). Near the top of the climb, Alex Dowsett (Sky Procycling) attacked, setting up Edvald Boasson Hagen, while drawing out Quebec champion Simon Gerrans (Orica-GreenEdge). Over the top of the climb, it became clear that a selection of around 25 had been made, including Sagan, Chavanel, Hesjedal, Hoogerland, Romain Bardet (AG2R La Mondiale) and Luis Leon Sanchez (Rabobank). With 8km to the finish, Greg Van Avermaet (BMC Racing) laid his cards on the table, getting away briefly before Hesjedal set off after him. Rabobank and Sagan worked to close everything down, with Gerrans along as well. With 5km to go, Nordhaug made his move, eventually igniting Moser and Kolobnev. Three kilometres later, Nordhaug was caught and Kolobnev was away. The podium appeared decided with the three only to determine the positions. Moser appeared as if he would get another statement victory after pulling back the Russian, but Nordhaug snuck around after the Italian locked up.